One of the most beautiful of the shrubby salvias. You see this being grown a lot in gardens and patios around the Mediterranean: 1.2m tall, bushy and covered in flowers from mid-summer to the Autumn. In the low light of Britain it starts to flower much later (usually early September) and it will not survive winters outdoors. Overwinter it in a greenhouse or take a few cuttings to grow on in the following spring. The flowers are white and emerge from rich purple calyces. The texture of the whole flower is soft and velvety. It is a plant that everyone has to stroke as they walk by. 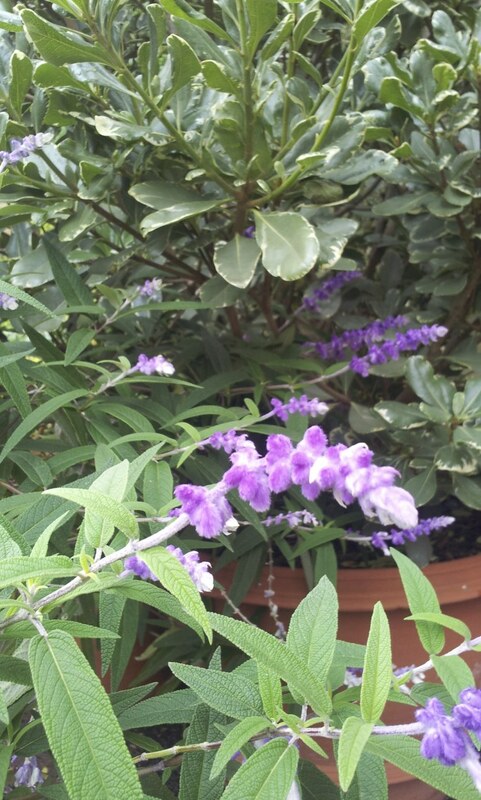 Like a lot of salvias it is native to Mexico and is commonly known as the Mexican bush sage in the United States.